Yesterday’s candle came as no great surprise, as silver prices followed gold higher,, ending the trading session with a wide spread up bar, and which reinforced the ‘hammer’ candle of Friday which hinted at a move higher, which we duly saw on Monday. 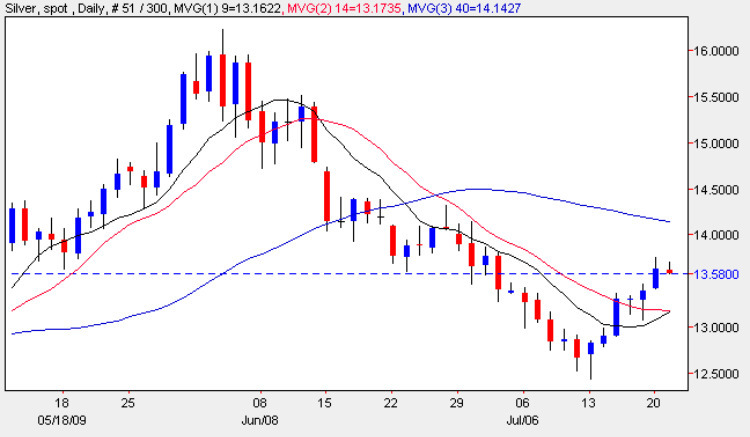 Whilst the price of gold managed to break and hold above the 40 day moving average, spot silver has some way to go to breach this important technical level, and with so much clear air still above, the outlook on the daily silver chart is less clear cut, particularly as we are now running into a serious resistance area between $13.60 and $14 per ounce. Only a break and hold a above this level in the next few days, coupled with the 9 day moving average crossing the 14 day can provide the necessary momentum for silver prices to climb higher once again, particularly if spot silver closes above the 40 day moving average as I expect in due course. The bullish tone of the silver chart is really not surprising given the mood of optimism which has permeated the equity markets following better than expected earnings results in the US. However, today and tomorrow sees Fed Chairman, Ben Bernanke, due to testify before the Senate Banking Committee in Washington. His testimony usually comes in 2 parts: first he will read a prepared statement (a text version of which is available on the Fed’s website at the the start), then the committee will hold a question and answer session. As the questions are not known beforehand the markets will seize on unguarded or unscripted comments, often resulting in heavy market volatility. Silver traders will be particularly keen to hear the Fed’s exit strategy from its current loose monetary policy together with the likely direction of short term interest rates and the fate of the US Dollar, all of which can impact the price of spot silver in the short, medium and longer term. My trading suggestion for today is to step aside and wait for the markets to digest the statement and subsequent comments.